There are a few sayings that Americans do not use. The first one that disturbs me is that we do not wish ourselves a great appetite before we sit to enjoy our meals. On occasion, I have heard it blurted out at restaurants, however, it does not have the same warm and fuzzy feeling as in other cultures. Mentioning it may increase the customers’ chances of returning to the restaurant or adding a few more coins to the staffs’ tip—not so genuine. On the other hand, it is routinely voiced in many other cultures, Bon Appetit being the most popular, followed by Buen Provecho, Guten Appetit, Buon Appetito, and what I always heard growing up, Kali Oreksi. 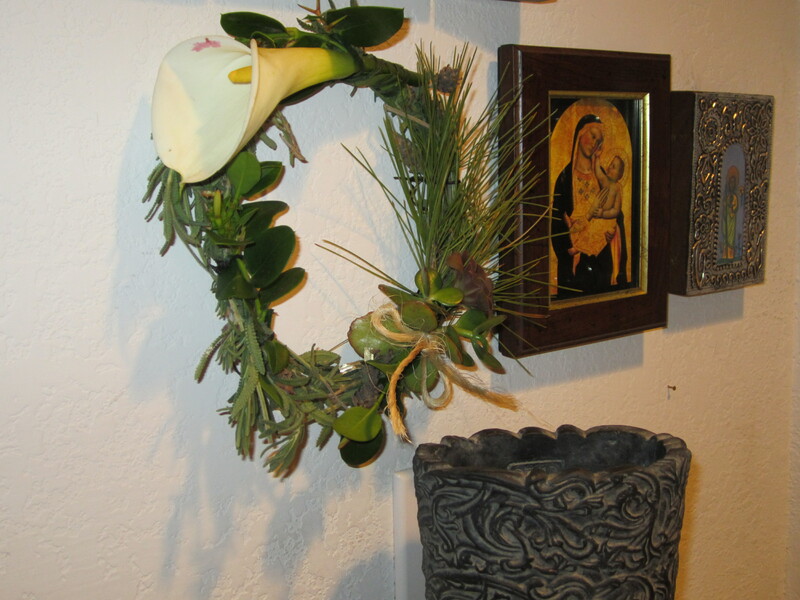 Another saying popular among the Greeks is Kalo Mena, or Happy Month, which is wished on the first day of each month. In May, the greeting Kalo Proto Maya, or Happy First May is heard throughout the day welcoming the beloved Spring to everyone’s heart. May Day on May 1st is an ancient spring festival and usually a public holiday; it is also a traditional spring holiday in many cultures. 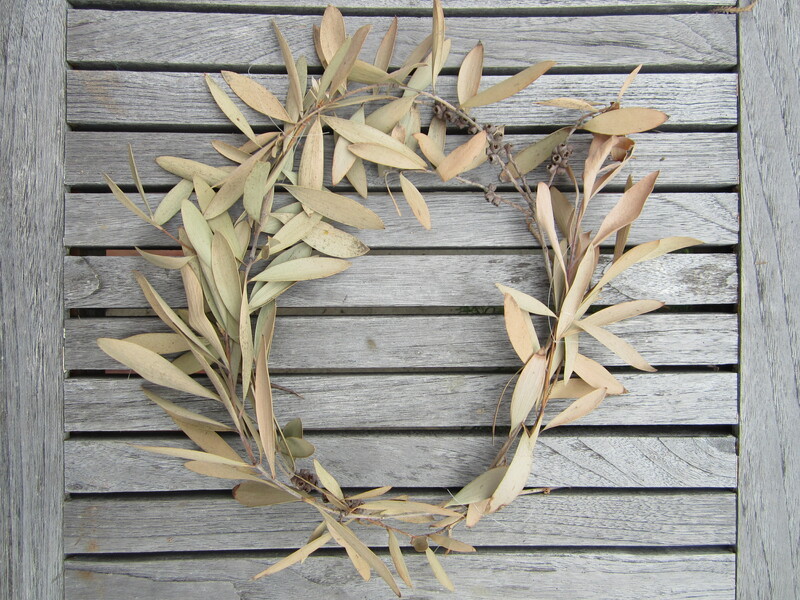 One common commemoration in the Hellenic world is the making of a May wreath, which is hung on doorways, balconies, and in chapels in the anticipation of good fortune knocking on your door. I, along with my trusted apprentices, am on the hunt for fallen branches again to make simple wreaths for May First. Already overbooked your weekly schedule? 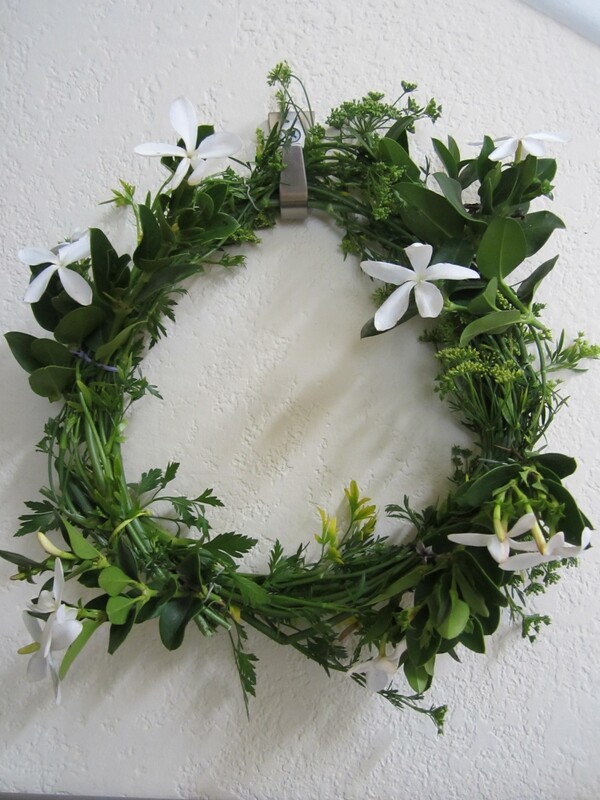 Look no further than your garden, yard, or patch of grass to consider what you can transform into a wreath. Lavender makes a wonderfully simple wreath, yet its sweet fragrance is sublime. The scent will permeate your space and inspire you for more spring projects. Tiny olive branches do the trick as well. Since my parsley is abundant, I tried it with its flower clippings. Warning keep this one outdoors if you create one of your own, the pollen will sprinkle your indoor space with its yellow dust. Searching for the perfect location for your labor of love project is just as important. Placing it on the front door will not only make an impression with visitors; it will also make you smile when you walk through your door. If you do not use your front door daily, consider another place you would enjoy seeing and possible smelling your wreath. The bedroom is a great one—to see a fresh made wreath every morning and before going to bed is not only cheery but also peaceful. Have space on the wall in the kitchen? Why not, after you finish saying Great Appetite or Happy Chowing (the preference is yours since there is not an official saying) you can look up at your wreath and smile. Remember the world will go on…search for a little beauty…step asid e to see it.